Land Size: 93.7 Acres Patented Mining Claim. Between 1937-1944 the mine was owned by the Governor of California, Henry T. Gage. The mine was the top Gold Producer in LA County in 1944. The mine still contains a fortune of Gold! In the 1987, over 3 Billion dollars of unmined gold was discovered. The Governor Mine contains over 3 billion dollars in Gold Reserves that has never been mined. Gold reserves were found underground that equaled 5 ounces of gold per ton of dirt. For an underground mine to be effecient today, at least 1/2 ounce of gold per ton of dirt needs to be present. The efficiency of recovering gold is about 90% more efficient than what the old timers could have done. Unlike most abandoned mines in California that were shut down because there was no more gold; the Governor Mine was shut down because President Franklin D. Roosevelt ordered all gold miners to work at iron mines in order utilize their mining skills to make weapons in World War II. Over 3 Billion dollars worth of gold were found by a geologist in the 1980’s and the drill sample reports will be available very soon. THE GOVERNOR MINE WILL GIVE YOU THE RETURN OF A LEGACY! The mine site is located about 52 miles from Los Angeles via the I-5 and I-14 Freeways, and 3.75 miles north-west of Acton, CA. within the Cedar Mining District, USA. Section 23 SBBM. The mine property trends east-west across a north-south trending ridge. Contact us for more documents, records, data, etc. The site is located in the California Transverse Range geological province. igneous and metamorphic terrains most of which consist of continental crust. The site is within the zone of influence of the Vincent Thrust, a major regional structure. The Vincent Thrust is known to host several small gold prospects. At the Governor Mine the gold in reported to occur within quartz veins trending N20W, and dipping 65 to 75 degrees to the NE. The quartz vein is hosted in the quartz diorite and hornblende diorite of the Pelona Schist series. The width of the vein ranges from 4 to 18 feet with an average width of 4 to 5 feet (Gay and Hoffman, 1954). The quartz vein exhibits several post- mineralization offsets of 2 to 5 feet. 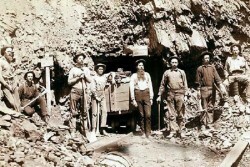 The early miners looked for rust coated quartz stained with oxidizing pyrites to indicate good ore. Historic data indicates the upper workings (100 to 400 feet in depth) are reported to host ore of 0.3 to 0.5 ounces gold per ton. Reports show that gold below the 400 foot levels show higher grades of gold, up to 1.0 oz. / ton. Historical data indicates that gold values seem to increase with depth. Gold values of 1.0 oz. / ton are considered high grade at today’s gold price of approximately $1,350 oz. Seeking Joint Venture to conduct exploration and drill samples. The gold bearing vein is narrow and Governor steeply dipping so underground methods would be the best option. Underground mining in California is the least difficult to permit because State Mining Regulations impact only surface disturbances.